About 80,000 people are expected to make a trip north to Higashi Village to enjoy the sights of the Annual Azalea Festival that runs from Mar. 4th through 21st. 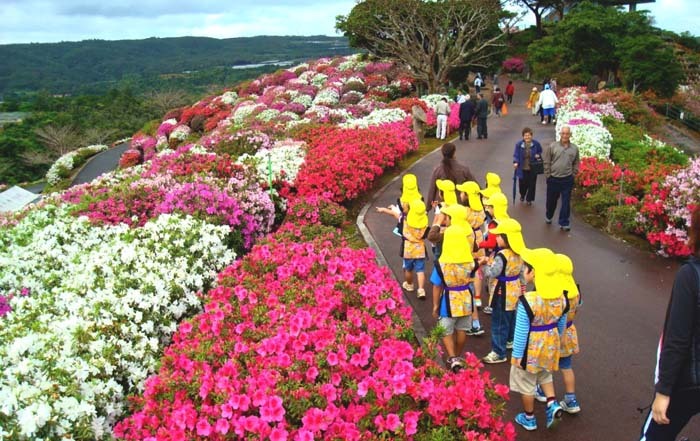 When people in the Higashi Village on the northeastern coast of Okinawa began planting azalea flowers on a hill in their village, they wanted increase cooperation and feeling of community among the residents of their community. 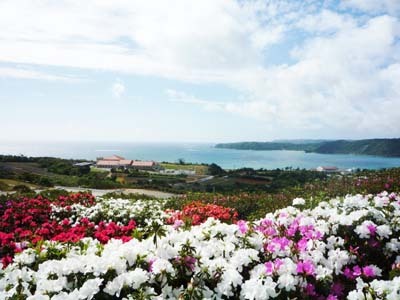 Besides the colorful flowers, the view from the Azalea Park Hill is worth the trip, too. Local politicians probably saw the effort as a way to revitalize the village and create a park for people to enjoy, and maybe attract visitors, too. They ended up planting some 50,000 of the plants on the hill, and now, 34 years later, the Higashi Village Azalea Festival has grown into one of the largest flower-themed events on the island. It usually attracts over 80,000 visitors during its three-week run for a walk among the colorful vistas of the park. It took six years for the park to be completed, and it finally opened in 1976. The festival is a part of the Okinawa Flower Carnival 2016, and there are various events scheduled to place like during the festival that is officially open from Mar. 4 through 21. The park is open every day from 09:00 to 18:00, except on Mar. 12, 19 and 20 when the hours are extended to 20:00. Entertainment in the park takes place on weekends featuring, among others, the world famous Nishihara High School Marching Band, other live musical performances, a road race and a lottery for accommodation tickets to the Higashi Village Eco Park lodges. The Higashi Eco Park is a eco-tourism facility, which the Azalea Park is an adjacent part of. The pink shell azaleas are one of the season’s first flowers to bloom on Okinawa. Admission to the 34th annual festival is ¥300 for adults and high school age students. Entry to those under 15 of age is free, as is parking in the area. Higashi Village Festival Committee representing the 2,000 local residents, and Okinawa Pokka Co. are sponsors of the event.